The Charleston Solar Pathway Lights in Copper are a set of 6 decorative solar lights that are ideal for pathways, driveways, and gardens. They are constructed of stainless steel, with an electroplated copper finish and real glass shade. 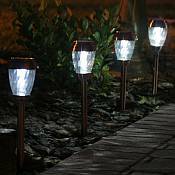 These solar lights are powered by integral solar panels and stay illuminated for up to 8 hours of light each night when fully charged. They automatically illuminate at dusk and turn off at dawn. They even have an On/Off switch when you do not want them lit. They have a replaceable, rechargeable Ni-MH battery, so there is no wiring necessary, and no operating costs. Simply install and enjoy.